Growing up Dad had a RockOla, and my uncle had an Inland, both bought during the $17/$20 days from the DCM. 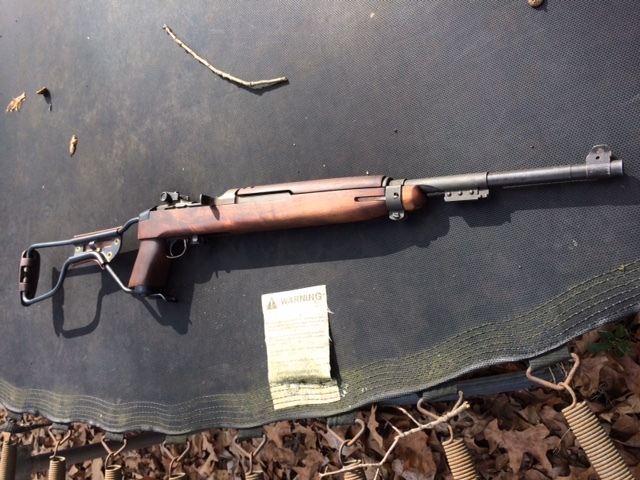 When I was a teen, a buddy of mine's grandfather was a dealer, and we discovered an M1A1 in his hoards of stuff and took it out shooting and I loved it. 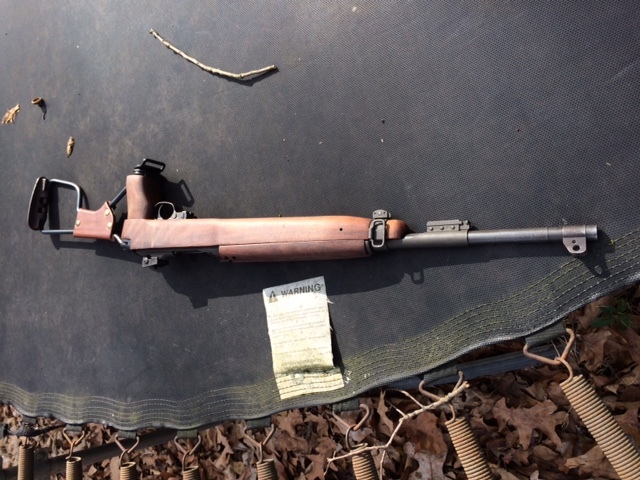 The grandfather caught us with it and we got a stern lecture on the value of an original M1A1 stock. he was deployed overseas and left it at my grandparents' house) , and had a blast with it. When my uncle retired, he came and got his Inland, so I've had a stock sitting here empty until I could find an affordable shooter. A couple of weeks ago a bubba'd/ sporterized carbine popped up on gunbroker, sold by a local pawn shop. Scope mount (replaced rear sight), ears cut off the front sight, and a monte carlo stock. That said, it was an Inland receiver with 12/42 dated barrel, and no permanent modifications were made so I bid on it and ended up with it. I need to find a Type 2 rear sight for it, a front sight, and a type 3 barrel band. Going to try to stick with all Inland parts just because I'm OCD and prefer it that way, although I realize that mixmasters are the general rule on carbines. That said, if I'm buying parts, why not stick with the easiest to find ones that also happen to be the maker of the major components? This one has a flip safety, double stamped serial number (almost didn't buy based on that alone), M2 mag catch, so it was obviously rebuilt. Had a type 2 barrel band with the swivel cut off . Barrel, receiver, trigger housing, and slide are all Inland. Winchester flat bolt. Haven't really looked at the little parts and don't think I'm going to mess with anything other than replacing the sights and barrel band with USGI parts. Welcome to the forum. Great folks here to help answer whatever questions and quandaries you may have. Might want to consider posting a pic or two. Especially the double stamped SN. I suggest filling out a Carbine Data Sheet for your Inland. Here is a link to the data sheet and info. I don't go back to the $17/$20 DCM days, but I bought my first Carbine (Winchester) for $195 in 1984 in Hawaii. I still love to shoot it, and .30 Carbine was also the first cartridge I ever reloaded. When I bought it, WWII ammo was still commonly available, and was a lot cheaper than new production, so that's what I shot through it until I had enough empty casings to reload. I'm sure you'll find the parts you're looking for, and you'll have a nice Carbine. You should post some photos when you get a chance. Hi and welcome to the Carbine Collectors forum from New Mexico! It's great to see you join this place, and it's the best no BS tech forum for M1 carbines imho. Welcome aboard from NC - have fun ! Jeepwm69, welcome to the forum. Thanks for sharing your background M1 story. Here's the GB link to the carbine I purchased. I wouldn't have even though about buying it had I not been able to inspect it in person prior to bidding. Got a nice barrel band and rear sight yesterday from New2brass here on the forum. Just waiting on my front sight now and I'll have it back in service. Thanks Dan! Gotta ask: Are there any markings on that Type II barrel band ? Got my front sight in over the weekend and got it installed. Also ordered an IO marked regular USGI stock for $59 from "What A Country" (had a crack, that was easily glued so as to be almost unseen, and matches the wood on my handguard perfectly), so all in all I have about $780 in it, including the extra stock. Ended up with a KI marked barrel band, an HI marked type 2 rear sight, and an R marked front sight. Now that I'm not really looking for a real M1A1, I'm thinking of getting a Fulton Armory M1A1 stock. Welcome to the forum. Nothing like an M1A1. Welcome to the forum! One of the best decisions you will ever make. Enjoy! I got a really nice IO marked regular stock for it too from whatacountry. Had a crack on the right side that was easily glued and is now imperceptible if you aren't looking for it. The regular stock is a great match in color and grain to the handguard too, so I can swap stocks if I want to and everything looks great. Unfortunately, the Fajen stock brought a whopping $10 on ebay. To make it worse, when I shipped it, I sent it in the triangular shaped Priority Mail box that the "whatacountry" stock came in, and the buyer received the stock in 2 pieces, so I just refunded his money. USPS must have been awful rough with it to snap it in two. Shame too. I thought it would have cleaned up ok if someone removed those ugly triangles. I just filed one. Given the amount it brought, almost not worth the effort, but you're right. Worth a try. I'll be shocked if the USPS pays out on it. None of the shipping companies ever take responsibility for damage they cause.